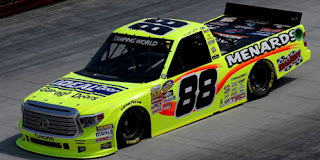 Matt Crafton picked up the 1st last-place finish of his NASCAR Camping World Truck Series career in Wednesday’s UNOH 200 at the Bristol Motor Speedway when his #88 Ideal Door / Menards Toyota fell out with engine trouble after 70 of 200 laps. The finish came in Crafton’s 374th series start. Just days after Jimmie Johnson’s first last-place run in his 529th career Cup start, Wednesday saw the end of the longest last-place drought among active Truck Series drivers. The 40-year-old Crafton made his series debut way back on October 28, 2000 at Fontana. That weekend, veteran driver Terry Cook had left ThorSport’s #88 Chevrolet to drive K-Automotive Motorsports’ #29 Dodge. In Cook’s place, ThorSport tabbed Crafton, who at the time was weeks away from securing a championship in the NASCAR Featherlite Southwest Tour. Crafton impressed in his Truck debut, coming home a strong 9th, and became ThorSport’s full-time driver for 2001. Other than a 2004 season with Kevin Harvick, Incorporated, he has not left the team since. Crafton had to wait until 2008 to break into victory lane, taking the checkers that May at Charlotte. The next year, he racked-up 21 top-ten finishes in 25 starts, ranking him a close second in points behind six-time race winner Ron Hornaday, Jr. In 2012, ThorSport switched from Chevrolet to Toyota, and from 2013 through the current year, Crafton’s bright yellow Menards machine has been the truck to beat, racking up 11 victories and back-to-back titles in 2013 and 2014. His two most recent victories, also back-to-back at Dover and Charlotte, came this past spring. On the night of June 13, 2016, just three days after Crafton finished 2nd to William Byron at Texas, fire broke out at ThorSport’s shop in Sandusky, Ohio. No one was injured in the blaze, but the team lost much of their equipment, including several race trucks. Still, the crew banded together, piecing together their three entries for the upcoming race at Iowa in the shop’s parking lot. The trucks of Crafton and teammates Cameron Hayley, Rico Abreu, and Ben Rhodes have not missed a race since the fire, but the team has not won since. At Bristol, Crafton was one of 37 drivers to attempt the 32-truck field. He ran 8th-fastest in the opening session, then was one of 11 drivers to break 15 seconds in Happy Hour, ranking 10th overall. In qualifying, Crafton made it to Round 2, but missed the final cut by five spots, leaving him 17th on the grid. Two trucks withdrew without putting up a time: the #68 Chevrolet owned by Bill Alger and the #74 of owner-driver Donnie Levister, who failed to complete a lap in qualifying. Sent home after time trials were Jake Griffin with MB Motorsports, Clay Greenfield, who moved from Alger’s #68 into Jennifer Jo Cobb’s #1 PitStopsForHope.org RAM, and Cody MacMahan, who attempted his Truck debut in Cobb’s #10 Chevrolet. Starting 32nd on Wednesday was 16-year-old Bryce Napier, who was making his 2nd Truck Series start and first since Martinsville this past spring. Napier’s #49 SupportMilitary.org / Lily Trucking Chevrolet fielded by Premium Motorsports was joined by three drivers sent to the rear: Austin Cindric, Parker Kligerman, and Rico Abreu. Abreu had backed his #98 into the wall in qualifying, and the ThorSport team had prepared the flat black backup truck in just enough time to roll onto the track. When the green flag flew, Cindric’s #2 Pirtek Ford from Brad Keselowski Racing was slow through the gears, dropping him to last. On Lap 2, Cindric climbed to 31st, dropping Matt Mills to last. The 19-year-old Mills made his series debut on Wednesday in Bobby Dotter’s #07 Thompson Electric Chevrolet. Mills was the first to lose a lap on the 7th circuit, and was four down by Lap 50. Next to find trouble was Tommy Joe Martins, who successfully made his Bristol debut after more than three years of trying. Martins had lost a lap early, then earned the Lucky Dog and was still on the lead lap on the 63rd circuit. Unfortunately, his #44 Cross Concrete Construction Chevrolet trailed smoke, sending him to the pits. Behind him, Mills and Napier spun, drawing the caution. On Lap 71, Martins was just about to fall to last when trouble found Matt Crafton. On Lap 71, right when the field prepared to take the green flag, Crafton unexpectedly pulled out of the Top Ten, slowed, then pulled onto pit road. Crafton, reporting a loss of oil pressure, pulled behind the wall, joining Martins. Crafton fell to 31st about Lap 80, then shortly after, Martins came back out, kicking the #88 back to 32nd. 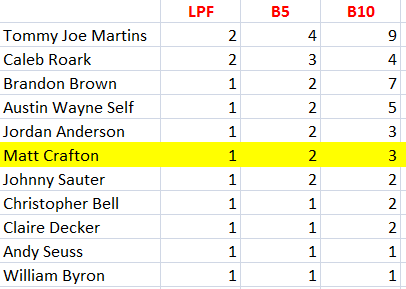 By then, Crafton had pulled out of the race, its first retiree. The last-place finish was Crafton’s first across NASCAR’s top three divisions, including not only his 374 Truck Series races, but his four XFINITY runs and Cup debut filling in for Kyle Busch in the 2015 Daytona 500. Martins ended up 31st, pulling of track around Lap 132. Crafton’s teammate Ben Rhodes also found engine trouble and pulled out after 128 laps, leaving him 30th. 29th went to outside-polsitter Daniel Suarez, who led 77 of the first 179 laps before his #51 Arris Toyota collided with Kyle Busch Motorsports teammate Christopher Bell. Napier rounded out the Bottom Five, finishing nine laps down with Mills. *This marked the first last-place finish for the #88 in a Truck Series race since April 4, 1998, when Terry Cook’s brand-new #88 Nokia / PBA Tour Chevrolet crashed hard in Turn 3 on the first lap of the Florida Dodge Dealers 400K at Homestead (then known as the Miami-Dade Homestead Motorsports Complex). The number had never before trailed a Truck race at Bristol.